Your vehicle is equipped with both left-hand and right-hand outside rearview mirrors. The mirrors can be adjusted remotely with the remote switch. The mirror heads can be folded back to prevent damage during an automatic vehicle wash or when passing through a narrow street. Do not scrape ice off the mirror face; this may damage the surface of the glass. If ice should restrict the movement of the mirror, do not force the mirror for adjustment.To remove ice, use a deicer spray, or a sponge or soft cloth with very warm water. The electric remote control mirror switch allows you to adjust the position of the left and right outside rearview mirrors. 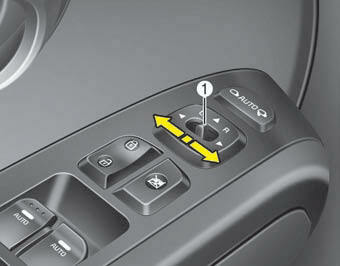 To adjust the position of either mirror the ignition switch should be in the ACC position. Move the switch (1) to R or L to select the right side mirror or the left side mirror, then press a corresponding point on the mirror adjustment control to position the selected mirror up, down, left or right. Left (1) : The mirror will unfold. Right (2) : The mirror will fold. 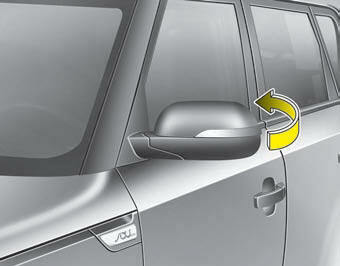 Without smart key system The mirror will fold or unfold when the door is locked or unlocked by the transmitter. The electric type outside rearview mirror operates even though the ignition switch is in the OFF position. However, to prevent unnecessary battery discharge, do not adjust the mirrors longer than necessary while the engine is not running. In case it is an electric type outside rearview mirror, don’t fold it by hand. It could cause motor failure.